With a brand new baby granddaughter, I am inspired to do some future kid projects at our cabin. More specifically, I have the desire to build a rustic playhouse. Since our only granddaughter isn’t even a month old yet, we have plenty of time to get a project like this done. 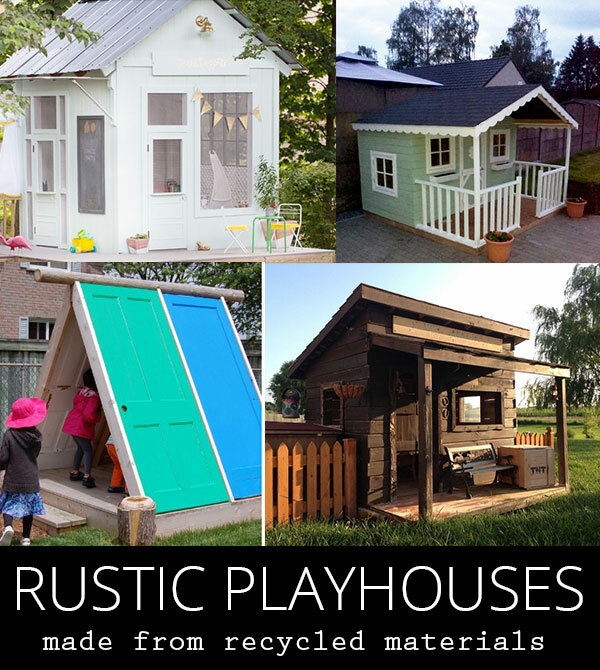 I found such a variety of plans for rustic playhouses and so many of them are just adorable. These ideas are some of my favorite contenders. Hopefully, you will see a style that you like too. This playhouse is such a cute western design. The style is quite rustic and it definitely reminds me of some of the little homesteads I have seen out in Colorado. Not only does this project look fairly easy to put together, but it uses recycled materials to help save on the cost. All of the materials and the instructions are well laid out at The Owner Builder Network. 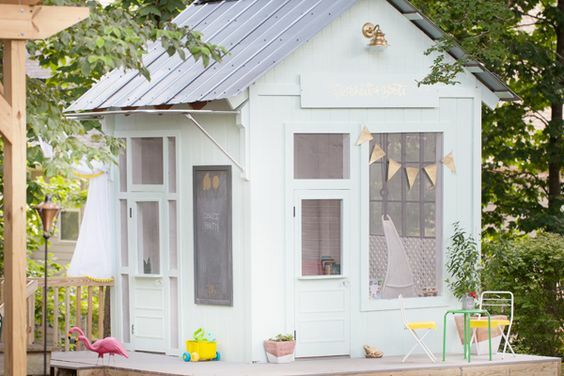 For more of a feminine design, this shed makeover really fits the bill. 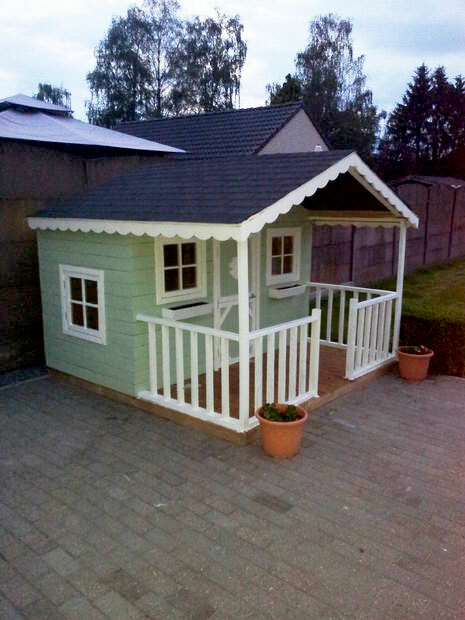 I love the idea of making over an old shed into a fun playhouse like at Home Depot blog. It may even be worth purchasing a new shed and enhancing it from there. The added features like the chalkboard, light, windows and doors make this playhouse so incredibly cute. I also love the decking around the playhouse for an extended play area. The white paint and metal roof give this one more of a clean rustic chic look. 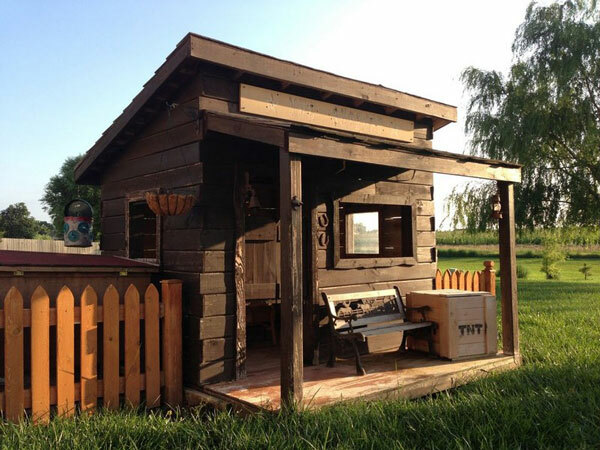 Can you believe that this adorable rustic playhouse was made from old pallets? Of course I would have to include a pallet project! I found this project at Instructables and the plans are very well laid out. I love the added touches of the scalloped roof, green paint and cute porch. Because of all of the little details, this playhouse looks extra special. What kid doesn’t like a fun teepee hangout? 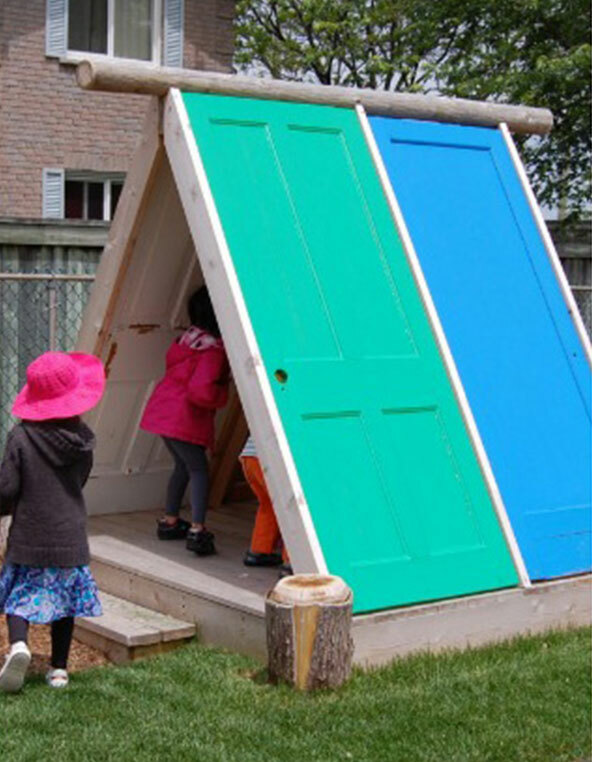 This teepee style rustic playhouse is easy to construct using recycled doors. Depending on where you find the doors, this project can be done very inexpensively. I’m really wishing that we hadn’t donated all of the extra doors from our last home renovation! Find the plans for this fun design at Play-scapes. The reason that I chose these particular rustic playhouses, was that all of them were made using recycled materials. I love it when I can reuse something I might already have for a fun project. Even if you didn’t have any of these materials, chances are that they could be found for a lot less money than using new materials. Which playhouse style did you like best? Can you see yourself building one of these?